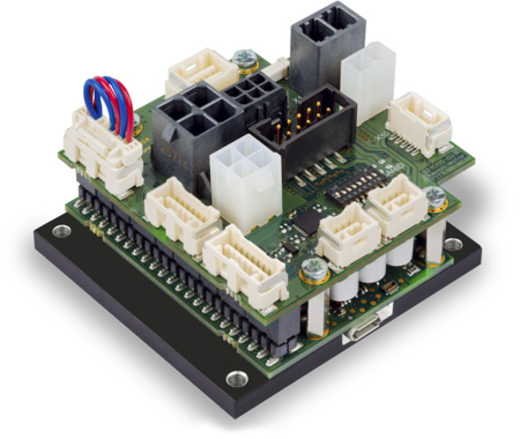 The maxon motor EPOS4 products are small-sized, full digital, smart positioning control units. Their high power density allows flexible use for brushed DC and brushless EC (BLDC) motors up to approximately 750 Watts with various feedback options, such as Hall sensors, incremental encoders as well as absolute sensors in a multitude of drive applications. EPOS4 controllers are specially designed to be commanded and controlled as a slave node in the CANopen network. In addition, the units can be operated via any USB or RS232 communication port of a Windows or Linux workstation. Moreover, the integrated extension interface allows optional communication interfaces, such as EtherCAT or other additional functionalities. Latest technology, such as field-oriented control (FOC) and acceleration/velocity feed forward in combination with highest control cycle rates allow sophisticated, ease-of-use motion control.